If the passionate love affair between sea salt and caramel or the enduring romance between rosemary and lemon has taught us anything, it’s that flavors, too, can have soul mates. While we may credit fate for bringing two people together, courtships in the culinary world are often pure chemistry. For Valentine’s Day, we spoke with our community of chefs, farmers, and food artisans to find out what food couplings they are enjoying this winter, and here we explore why these timeless duos are more than just flavor flings. Our fondness for sweet-salty foods is tied to our inherent cravings for sugar and salt as calories and minerals essential to bodily function. Coupled together, they simultaneously activate two separate pleasure senses. Salt also has the ability to enhance sweetness, creating layers of flavor without muddling them. Boonie Deasy of K&J Orchards works with some of the Bay Area’s top restaurants, providing fresh fruits for their seasonal menus. Right now, Boonie loves Perbacco’s risotto, which features K&J’s Asian pears. “You get some salty creaminess from the risotto and sweetness from the pear,” she says. Achadinha Cheese Company staff say they, too, are “always going for that sweet and salty balance” when pairing their goat cheeses with other farmers market products: chèvre with honey and pear, and feta with jam are among their favorites. Citrus is almost any dish’s better half. Like a great partner, acidity makes the best qualities of any dish shine. In the playful balance between sweet and sour, sweetness tones down the astringent, while tartness adds complexity to sugars. Farmer Larry Glashoff enjoys pairing Glashoff Farms’ brown sugar and cinnamon walnut butter with their farmstead lemon curd. The sharp tartness of the citrus and the creaminess from the walnuts’ fatty oils deepen the flavors of each. In the winter, tart citrus and sweet root vegetables make a common marriage for salads. Chef and author Joyce Goldstein celebrates the simple pleasures of sugars, acids, and fats in her radicchio salad, in which sweet beets and tart orange slices drizzled with a balsamic vinaigrette work in tandem to soften the radicchio’s bitterness without compromising the pop of flavor each brings to the dish. Bitter and salty may sound like an odd couple, but consider how often we pair bacon and Brussels sprouts, or collard greens and ham. Salt neutralizes the bitterness and allows any natural sweetness to shine though, similar to how the sweet undertones of grapefruit emerge with a sprinkle of salt. While we all know oysters and bubbly make a luxurious pair, our friends at Hog Island Oyster Company suggest pairing their famous Sweetwaters with an Old Fashioned or an IPA, rather than champagne. The bitters or hops unearth the oyster’s natural sweetness, which can be masked by the sugars in the bubbly. The rich, meaty flavor of umami comes from the presence of glutamate, an amino acid naturally occurring in aged parmesan, kombu broth, and shiitake mushrooms, and common to protein-dense foods. Umami is closely linked to saltiness, so it naturally pairs well with sweet foods. The addition of acid enhances an already synergistic flavor pair. Chef David Murphy seeks a similar flavor harmony at Whitechapel: “We preserve Sudachi lemons for about two and a half months. The ferment takes the really bright citrus and gives it a deep, earthy umami.” Coupled with the last syrupy-sweet persimmons of the season, the three assertive flavors stimulate the whole palate. 1. Take it slow. Before jumping into any flavor pairing, “We start with each fruit straight, and after that we riff on it,” says June. Only by making straight Page mandarin marmalade first was June able to get to know the flavor well enough to find a perfect match in Kaffir lime. 2. Figure out what you want. Determine what kind of flavor relationship you are looking for. “You say to yourself, ‘Strawberry is sweet. 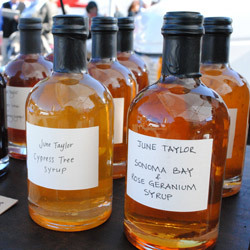 How can I take it in a savory direction?’” June often incorporates herbs for a savory hint, like in her Sonoma bay laurel and rose geranium syrup, or her Mariposa plum and rosemary conserves. 3. Break out of your comfort zone. Be daring and experiment to find that ideal but unexpected pairing. “If I want something very feminine, sweet, and floral, I’ll put sweet with sweet,” says June. “But it gets boring just doing sweet with sweet, so I might bring in tart or savory.” Her blackberry with blueberry conserves were already everlasting love in a jar, but pairing blackberry and wild fennel elevated the flavors to a new level. 5. Finding “The One.” Taste is subjective, so there’s no right or wrong way to pair flavors. “You basically have all these parameters that you’re constantly juggling and playing with,” says June. So whether Damson plum and port, or Red Cloud apricot and white sage conserves are your jam, experiment until you find flavor pairs that make your heart, and taste buds, sing. It’s not too late to find the perfect gift for the food lover in your life! Sweep your sweetie off their feet with artisanal indulgences from our Valentine’s Day gift guide. Cheese pairing photo by Amy Verhey.